Home > Timing Belts MXL-XL-L-H... > XL Timing Belts. 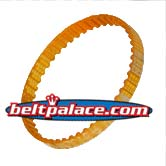 Trapezoidal Tooth Gear belts - 0.200" Pitch > 140XL037-UG Timing belt TBT/XL. Polyurethane/Fiberglas XL Timing belt. 140XL037-UG Timing belt TBT/XL. Polyurethane/Fiberglas XL Timing belt. 140XL037-UG TBT/XL Timing Belt. 14” Length. 75 teeth. 3/8” (0.37-UG”) wide. Polyurethane (Yellow-Orange translucent plastic) with Fiberglas cord backing. 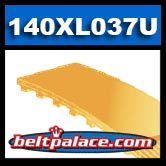 Compatible with “140-XL Series” industry standard Timing Belt. Popular replacement belt for electronic equipment and power tools such as power sanders, woodworking tools & lathes, pumps, and arcade racing video game feedback controllers. Color shown may vary. 140XL037-U Fiberglas cord reinforced Arcade Racing Game Feedback Controller belt. Stronger than Kevlar! Toothed Gear Belts marked “140XL” at 3/8” Width, Polyurethane (plastic type material). Replaces Sears 113226424 Sander Replacement Belt 814002-1. Replaces: JASON 140XL037, Browning 140xl 037, Goodyear 814002-1, McMaster-Carr 1679K126. Sears Part: 621826-000 belt for Craftsman 315.11760 (31511760) belt sander. 140XL037 Timing Belt. Specs: 70 Teeth, 14" Pitch Length. Cross Reference with: Browning 140xl 037, Goodyear 140XL037, Grainger 2L564, Grainger 1DHH9, McMaster-Carr 1679K126. Used in Sanders, power tools, robotic equipment, water pumps, machine belt, and vintage game controllers.